...and not a moment too soon. I shift over to clay myself next three months. Too bad my favourite isn’t playing, but here’s to an awesome clay season for everyone! He only plays on the important surfaces these days. That’s for the other 10 threads, already made myself hoarse on the subject. He knows best and I shall miss seeing him on clay. This one is a simple celebration of clay - all fans! Sort of like season’s greetings! I’m really excited about both transitioning over to clay myself and the pro events! Clay tennis certainly has some beautiful settings. Roll on MC! F me. No fed and Kyrgios will most likely do jacksh1t. I wish they’d be as open about the colour of the damn tennis ball as they are about the court itself. Clay is gorgeous and has that timeless feel about it, like grass - except on television following the ball on clay is an eye strain. In a way this might be good for me as a FedFan - will begin to pay more attention to other players with more of an open mind. At some point I’m going to need to let go of Fed as my favourite, or I’ll stop following tennis entirely. I guess white balls would show up better against the red surface than yellow ones. Is clay because people tried and failed to grow grass or was it invented by cleaners lady? Just wait for the Bullzillions to arrive, and this will become yet another "Rog afraid of Rafa" thread . I will be waching some clay. If Rafa is back on tour healthy i expect something like last season. I dont expect too much of NextGen, will probably only get dissapointed . I fear a match between for example Rafa and Chung will be a nightmare worse than when Chung played Roger at AO. Really hope Thiem will be ready for clay! 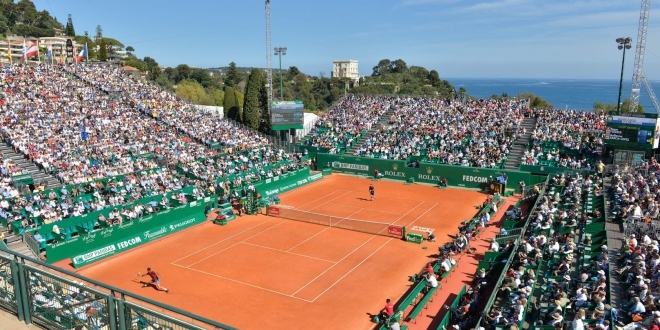 I feel like Monte Carlo is a tournament that every tennis fan should have to do once. My goodness what a beautiful setting! I hope to someday be financially successful enough to visit MC. Could we pwetty please not have yet another thread with the bickering and snipes? @Red Rick - excepting you. Be as persnickety as you like. We’re all aware FogFans can’t help themselves. It’s a style of its own. Likely will never see Fred on the red dirt again. There is no natural tennis landscape prettier than this one. Out of interest, given the value of land in HK, what does it cost to play tennis at a club like that? Kitzbuhel, Austria is pleasing on the eye. Petch takes the WORST pictures, but broadcasting he's actually cute in a weird way lol. Not sure why they call it Red Clay....looks Orange to me. Looking forward to some dirt battles. It's what I've been saying about my hair for almost 20 years. Red wine isn’t red either. Any pic you could share? Tennis is so goddamned expensive here it’s cost effective for me to spend spring/summer in Europe. Per hour in HK its about $25, in Europe never pay more than €5. Above clay courts are in Europe, except the one with the Yonex advertising, which is in Taiwan. Great. Tennis on dirt. Is there anything more crappily pov than that?? Wake me up in june when tennis emerges again from the dark ages. Diego Schwartzman has improved markedly during the past year. I see him going to a semi in either a Master’s or a slam event on clay. This kid appears built for clay. I hope that I am right. I cannot wait to see this kid play. That's the wrong message to me haha. I'm viscerally anti-extortion. Tax evasion is heroic. The world needs more Monte Carlos. I think he should do well at all of these events. He had a good tour on S. American clay earlier. He's fun to watch. Best thing about clay: Its one step closer to the grass season. Hopefully will be more competitive this year, would be great for the game and would help us separate genuine love for the surface from infatuation with any single player. Deep in the twilight of the tail end of his post-prime career Fed becomes a clay specialist, and wins 4 French Opens. Until the clay season starts, I recommend you watch the video with all 9,968 Isner career aces. If you are looking for a more fulfilling experience, there is also one with Karlovic's 12,583. Well indoors in the UK you aren’t looking at £16 off peak £25 peak per hour. But outdoor clubs are mostly very reasonable, like £100-£350 per annum with no court or light fees. Public courts might be £8ph average so worth joining a club unless you hate clubs. Never been there but watched and admired on TV.